This year has seen a record number of hurricanes forming and hitting the US soil. Hurricane Harvey had just finished wreaking havoc on Texas when Irma was reported to be even a bigger threat to the USA. With Jose and Katia not far behind, we may experience more destruction than ever before. If you live in an affected area, you should do everything you can to follow the instructions of the authorities. However, you can’t not think about your home that you may have to leave behind. Before you can even start cleaning up the mess, you need to make sure that the house is safe to be in. that it is structurally sound enough to be restored. You may need help from an inspector if you are unsure, since not all damage is visible straight away. Once you have been cleared by inspectors, you can start assessing the damage. The first thing you need to do is get everything out of the house. There you can assess what is ruined beyond salvation, and what can be restored. Additionally, things can dry up quicker outside than inside a damp house. Getting things out of your house has another important role – preventing mold growth. Mold thrives in damp and dark places, and it can pose a real health hazard. It is important that you remove all flood water as it may be highly contaminated. There are specialized pumps and other devices which remove both water and excess dampness from the air and walls and floors. Restoration companies use these devices regularly, so it is likely that you will have to hire a company to do this for you. 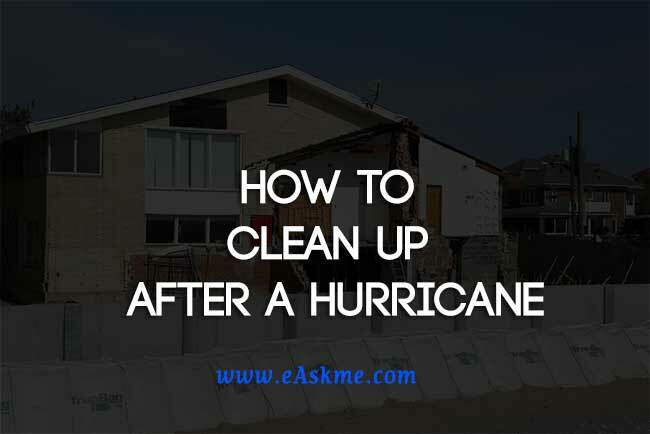 After you have removed all the water out of your house, the actual restoration can begin. It may take a long time, and cost you a lot of money, but rebuilding your home is paramount to your return to your normal life. The floors are likely to be the most affected by the flood. In some cases, you may have to replace all of your floors, especially if you had hardwood floors or carpets. In some cases, tiled floors can withstand flooding undamaged. Another thing which is unlikely to survive a serious flooding are electrical installations. Most modern homes have fuses which shut off electricity in such cases, but with extensive water damage, you may encounter serious electrical problems as well. Do not turn on the electricity in your home until you are certain that all of the water has been removed and that there aren’t any problems with the electrical grid. Water isn’t the only problem hurricanes bring with them. Strong winds can do a number on your roof as well. This damage can range from a relatively mild loss of roof tiles to extensive damage to both tiles and the wooden construction underneath. The damage can further be exacerbated if the wind has blown some debris into your house, further damaging it. Roofing companies are likely to be extremely busy in areas affected by a hurricane, so you might have to wait a while before you can start repairing your roof. Regardless, you need to cover your house to protect it from the elements while you wait.